Please see our Books page (on the Home page menu) for a lot of books on Victorians. Also, please understand that when we're speaking Victorian, the "Pen" is what we would call the "Nib" if we were referring to a fountain pen - it has no breather hole but DOES have a slit, and the "Holder" refers to what we would refer to as the "Feed, Section, Barrel, and Cap" combination if we were discussing a fountain pen. ITEM #5740: SMALL STERLING SILVER RING TOP TWIST PENCIL (3 5/8" LONG). Unpolished. To buy please email Pentooling. Be sure and provide a shipping address so a shipping cost can be calculated. Also, make sure Paypal has your correct shiipping address, as I use them to generate the shipping paper. ITEM #SANFORD WELL: SANFORD GLASS INK WELL. Square base with cylindrical "tower". Two available. ITEM #BRASS INKWELL: BRASS INKWELL WITH SPRING LOADED LID AND INTERNAL GLASS BOTTLE. ITEM #5305: TORTOISESHELL AND GERMAN SILVER VINTAGE DRAFTING SET. Gorgeous shell flip-top-box put together with 67 tiny silver nails/pins and silver banding. Includes a folding, collapsible, reversible compass/divider. It looks like it used to have a ruler, either silver or ivory, or wood, but that piece is gone. ITEM #5665: VICTORIAN RETRACTIBLE COMBO DIPPER PEN HOLDERNWITH FLEX PEN. Nickel plated, some wear annd brassing, and it writes a long time per dip. This piece has intentionally not been polished as it has a charming patina. Pencil uses .088" (2.2 mm) leads. Pen is marked "M. Meyers Britan Birmingham 1917". Holder is 4.76" retracted and the assembly extends to 6.25" with both ends out. ITEM #4206: GORGEROUS 8" LONG DIPPER WITH REPOUSSE GRAPE VINE PATTERN. Fine flexible pen. Writes well for a dipper. Intentionally not polished, having a beautiful patina. Barrel has some illegible markings that may be script, shown in the last three photos. ITEM #5348: FLEXIBLE EDWARD TODD and Co. No. 2 DIPPER. The holder is a retractable 'Edward Todd No. 2' and the Flex XFine nib says 'A EDWARD TODD & Co. No. 2'. 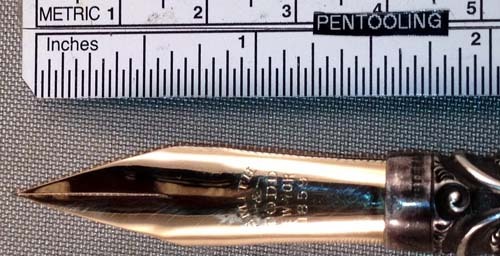 The underside of the nib is stamped 'MAY 16 87' (this shows up in the bottom photo). A high viscosity dip pen ink is recommended for this pen. It won't perform well with fountain pen ink. ITEM #1803: A FLEXIBLE UN-NAMED BAKELITE DIPPER. Has a plated TURNER 22 Broad flex pen in a bakelite holder. ITEM #DIP INK: ENHANCED VISCOCITY, LOW SURFACE TENSION DIP PEN INK. This ink makes your dip pen perform much better than fountain pen ink. Thick and very black. Not intended for fountain pens. 2.5 ounces. ITEM #5430: AN UNAMED DIPPER W/ WOODEN and GOLD FILLED HOLDER WITH A HUGE, FLEXIBLE "LEROY W. FAIRCHILD No. 8 NEW YORK" 14K PEN. It is highly recommended that this pen be used with a specialized dip pen ink, not a fountain pen ink. ITEM #5425: K&E (KEUFFEL & ESSER) DORIC JUPITER #9406B DRAFTING SET. Very clean, obviously used very little. Circa 1955-62. case: green leather grained cloth, 10 1/4" long, 4 7/8" wide, 7/8" thick. Overlapping flaps w/ snap closures. Fitted interior lined with green velvet. Flat design, Chrome plated (plating in excellent condition). Most major parts marked "K&E, Germany. Exterior case is stamped "K&E (Logo) Doric Jupiter 9406B". The 4 digit product number and old style flapped case (v.s. the hard hinged case ontroduced in the 60s) makes this piece likely to be from the late 50s. ITEM #5468: TECHNICAL SUPPLY COMPANY GERMAN DRAFTING SET. This is a german set in a black velvet lined, folding, snap shut case. It appears to be sort of a mixture of more than one set, as it has two designs on the finials atop the compasses and one piece doesn't quite fit into its slot in the tray. here is an extra compass included and one long slot in the tray with nothing in it. One of the changable tips for the main compass is missing a knurled nut. A good parts kit or the start of a project. The set has a patina about it, but the components are well made. ITEM #5347: EDWARD TODD DIPPER; #4 HOLDER WITH '14K' BROAD FLEXIBLE NIB. Retractable pen with wooden taper. ITEM #5016: VERY HEAVY GLASS ENGLISH INKWELL. With hinged brass lid and collar on glass base with floral pressed glass design on bottom. Found at a sale on the California Centrl Coast. Very well made piece. ITEM #5017: FOUNT-O-INK INKSTAND BOTTLE. This is one of Fount-O-Ink's upside down bottles intended to be inverted and inserteed into one of their ink stands, although I haven't seen thee stand that takes this one. It is obviously intended for that type of use becaus of the very ornate designin thee bottom and a fat breather tube contained inside the bottle used to get air up into the top (of the up-side-down bottle) as the ink gets used. Partially filled with brownish ink, still in solution with no precipitate or sediment separated-out. ITEM #4863: C-THRU LETTERING PEN. New in box. With full length inkview green transparent barrel. A stylographic type pen for doing letteering on drawings. This new one has the full length (un-broken) stylus still intact, full length. Usually when youu find these, the stylus is considerably shorter from being broken. ITEM #3306: A STERLING TELESCOPING VICTORIAN PENCIL 2 9/16" RETRACTED AND 4 3/4" EXTENDED. Some dings on the ends shown in photos. Uses .075" diameter lead. ITEM #3369: 9 Kt. GOLD VICTORIAN PENCIL, HALLMARKED. 2.176" LONG, .207" square cross section on body (slider is larger). There is a very tiny, tight fracture shown under the left side of the hallmark in the second photo. It does not interfere with the function of the pencil. No dings or dents. ITEM #2368: NICKEL PLATED MINIUATURE EARLY MECHANICAL PENCIL. 3.75" long. Ues .086" lead which is directly attached to the top end of the pencil and moves in and out with the top end which also moves in and out. No dings or dents. ITEM #2425: VINTAGE DRAKE FOUR COLOR NICKEL PLATED MECHANICAL PENCIL. Marked "U.S. Zone Germany". 5.25" Long, Eight sided top section (.380" across) slides down over the lower round cross section (.300" dia.) to extend the lead which is selected by turning the top part of the pencil while it is up. This uses leads somewhere between .046" and .080". None are available Iin my searches so far so I can't say for sure what the size is. All four lead handling parts of the mechanism are present and operational. No dings or dents. Some high point brassing. ITEM #2444: Rolled Silver Ingersol Redipoint Pencil 3 3/8" long x .32" dia. Uses standard .046" dia. leads and mechanism extends & retracts the lead. The Guilloché (engine turned) pattern on the surface consists of squares and lines. No dings or dents. ITEM #2728: Hallmarked Sterling Silver Yard-O-Led pencil. 4 5/8" long x .312" dia. The mechanism works, propelling standard .046" leads (1.1mm in Socialist units). This piece has Sterling & other hallmarks on the clip, the cap, and the body. The clip and cap have a lion strutting with his tail over his body. The cap is also inscribed with "Made in England" and "Patent 422767".The body of the pencil has "M & Co followed by an "M", the lion, and a square. The body is also engraved with the name "M. C. Brown." on the cartouche. The body is also covered with a Guilloché (engine turned) fish scale pattern. No dings or dents. Sterling REPRODUCTION pencils re-issued by Yard-O-Led are selling for $340!! ITEM #3305: Sterling Stockman's Pencil. Also known as a "Port Crayon", these were used by stock traders years ago. This piece is marked "STERLING" on the tip with no hallmarks. It expels and retracts a waxy .219" "lead". It is 5 1/8" long x .3525" dia. No dings or dents. ITEM #3386: Hallmarked German Sterling ballpoint. No name, but the cap lip has the words "Sterling" & "Germany" witha hallmark between them consisting of a script "B". 4" long x .260". No dings or dents. ITEM #4670: VICTORIAN DANCE CARD PENCIL. Pendant style, looks to be nickel plated. Does not telescope. You hold the front end and turn the back and a .075" lead comes out of the front. ITEM #4516: STYLOGRAPHIC DIPPER PEN, "LEROY" by K&E . With self contained ink pot, a knurled knob to turn the stylus, and a knurled knob to loosten the front end so the vertical angle can be adjusted. I've never seen such a complex dipper. ITEM #1778-1997: A VERY CLASSIC DECO FOUNT-O-INK DESK SET SCULPTURE. Features a Cocker Spaniel and an ink well consisting of a cast aluminum box + lid which accepts an up-side-down square FOUNT-O-INK bottle of ink which is included (full) with this item. Also included is an original FOUNT-O-INK dipper pen which fits the set. ITEM #MISC. DIPPER PENS: The following dipper pens are available, listed in the order shown, left to right: HUNT #512, SPENCERIAN #42, C. BRANDAUER #262, SPENCERIAN #2, SHAKESPERIAN #3, FOUNT-N-GRAPH #7 . Specify which you would like to order. ITEM #SPEEDBALL DIP PENS: The following dipper nibs are available, listed in the order shown, left to right: A-1, A-1, A-2, A-3, B-1/2, B-4, B-2, B-5 1/2, D-2 . Specify which you would like to order. ITEM #JOSEPH GILLOTT's #1155 STAINLESS SUPER FALCON PENS: These are FINE, slightly flexible, stainless, non-plated pens. ITEM #ESTERBROOK DIP PENS (TIPS): The following dipper nibs are available, listed in the order shown, left to right: #11, FALCON #048, #13, #1, DRAWLET #12, #14, #13, and PENSCO 520. Specify which you would like to order. ITEM #WARREN's COMBINATION NON-DETACHABLE: CARDBOARD PEN HOLDER & STEEL NIB. Could this be the progenitor to the BIC? This is a Victorian dipper made with a spiral rolled cardboard handle. The smaller blue ones have "WARREN'S COLLEGE" steel pens and the slightly longer black ones have a Falcon style pen with a bronze colored finish and "A3" stamped on the pen. These were made in North Manchester, Indiana ca. 1890 and they sold new for $.01 each. Specify color desired. ITEM #INKWELLS: ANTIQUE SCHOOL DESK INKWELLS. MADE FROM GLASS AND BLACK HARD RUBBER. These are the real pig-tail dipping thing! Made by the American Seating Company. Some are marked "59" and some are marked "60" on the bottom of the glass, but dimensionally they are all the same size. 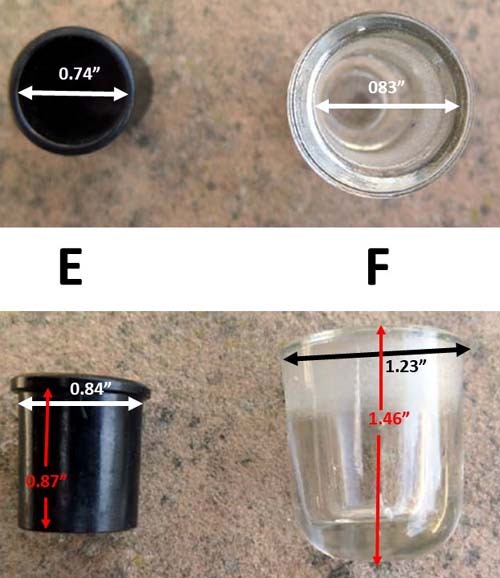 The glass part depth is 1.14" and the pen hole in the top of the well is .443" diameter. 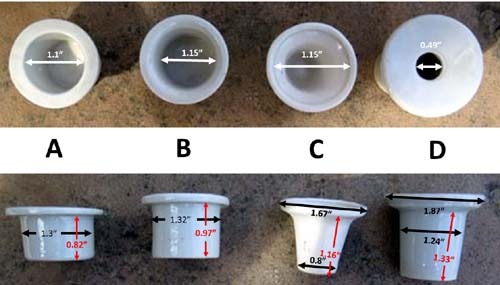 They are made to fit into a hole that is 1 1/2" diameter with the lid above the surface, or, the lid will still stop the unit from dropping through a hole measuring 1.86" in a more flush installation. The glass extrends 1 5/16" below the black hard rubber lid. The screw-on lid includes a swinging closer. ITEM #NAVY: NEW OLD STOCK NAVY INKWELLS. We've all found these at flea markets, sometimes just the top, sometimes just the bottom, sometimes even both parts together, yet totally un-marked. And there is a glass part on the inside of the lid that you never see when you find one - they have all broken off long ago. Check this out, though; Now we know where they came from; I found a lot of them still in the boxes on my last trip to Denver, and the boxes are marked with the contractor (Chas. G. Stott Co.), the manufacturer (Preferred Products), the place (Toledo), the purchaser (NAVY), and the Navy's stock # (53-1-5220). All in and on a crisp, clean, un-damaged box. 2 13/16" dia. at the base X 1 13/16" high. A through D: White ceramic with listed dimensions. $20 each. ITEM #3569: Brevete Multi-Colored Early Mechanical Pencil. This is a project piece; It does not work and comes partially dissassembled. It has a window near the top that displays the colors red, black, and purple, presumably to indicate the color of the lead selected. It also comes with (2) metal inserts with stubs of .080" leads in them. It is nickel plated with a lot of brassing and one ding. This should be a fun project for someone that likes these things. ITEM #5041: CERAMIC DESK BASE WITH INKWELL. A gorgeous, quaint piece of art pottery. If you're both a pen collector and a pottery collector, this item fits both niches. The piece is signed on the bottom, but I can't make it out. 7 1/4" x 6" x 2 1/2". No chips. ITEM #4474: KEUFFEL & ESSER DIPPER DRAFTING PENCIL FROM THE EARLY 1900s. Adjustable No. 6 (or N0. 9 - depending on which way it's read; it shows up as "6" if you look down on it while holding it in your hand. This has a knurled headed screw to adjust the thickness of the line and a reservoir to hold ink.These came in sets of several different sizes. ITEM #4366: SENGBUSCH HANDI-PEN, BOXED IN MINT CONDITION WITH PAPERS. With Sengbusch FINE #17 gold plated nib. Black plastic pen holder with no flaws. Like new. It would go great with the near mint Sengbusch Sedlf Closing Ink Stand (below), item #4296. There is a second Sengbusch pen available, #4381, almost identical, same shape and maybe 1/8" shorter with a slightly smaller diameter for $25. Please inquire if interested. ITEM #4688: BOXED MABIE TODD and Co. MAKERS NEW-YORK DIPPER. With a MABIE TODD and Co. NEW YORK No. 2 pen. The pen holder breaks-down so it can fit into a short velvet lined box. ITEM #4494: 900 SILVER TELESCOPING MECHANICAL PENCIL WITH SPOON CLIP. Also has an HS or SH marking on the tail end with the letters on top of each other. This pencil extends to 6" long (extended) and collapses to 4 3/4". The engraved pattern on the outside barrel is continued on the inside barrel also. The number "900" shows up on the cup of the spoon clip. ITEM #3205: LUCKY CURVE WET NOODLE. This is a converted VERY FLEXIBLE Victorian "A MORTON NEW YORK 1st GRADE" pen with a high end Parker Duofold SENIOR Flat Top Lucky Curve fountain pen put on it. This is a very flexible front end on a button filling fountain pen with a large ink capacity. Just keep in mind, as Susan Wirth points out, this type of conversion likes too stay home and does need to be dipped on occaision. See the writing evaluation/sample below that Susan was kind enough to provide.This is a wet pen. ITEM #5126: CARVED BONE VICTORIAN COMBO. .090" retractable lead on one side with a Mabie Tod #2 nib on the other side. Hand carved. We know it's bone and not ivory since the material has pores visible under magnification. No missing pieces or broken parts of the carving. ITEM #5249: HAND CARVED BONE DIPPER HOLDER. The business end of this dipper stows and screws into the holder. There is a hard to notice repair to the barrel. ITEM #5078: PEARCE'S MONARCH WET NOODLE. This is a converted VERY FLEXIBLE Victorian "FERRIS & WILLIS" pen with a gorgeous Pearce's Monarch eyedropper filling chased black hard rubber fountain pen put on it. This is a very flexible front end on a HUGE 5 5/16" fountain pen with a huge ink capacity. Just keep in mind again, as Susan Wirth points out, this type of conversion likes too stay home and does need to be dipped on occaision. See the writing evaluation/sample below that Susan was kind enough to provide.This is a very wet pen. It is also cosmetically perfect with crisp chasing and no browning of the hard rubber. Crisp imprint, too. ITEM #3388: MOTHER OF PEARL HOLDER WITH WRIGHT & SPENCER No. 2 PEN. Pen is flexible. Box is sort of rough. Tip of mother of pearl holder is intact and not broken-off. ITEM #2431: TINY STERLING SILVER VICTORIAN RETRACTIBLE PENCIL. 3 1/8" when extended, 2 1/4" when retracted. Hand worked metal in a snail pattern. The mechanism works by twisting the top half of the pencil relative to the bottom half. Uses .046" standard sized leads. Repousse pattern on body. Body is .183" diameter. No dings or dents. ITEM #3134: Nickel Plated English Mechanical Pencil. 3.5" long x .1885" dia (body), .261" dia (ball on top). Extends & retracts a standard .046" dia. lead. This piece is marked "ENGLAND" on the pencil tip. No dings or dents. ITEM #4604: VICTORIAN TELESCOPING (BOTH ENDS) 14K GOLD DANCE CARD PENCIL DATED 1908. You pull on the back knob, it comes out and the front goes out in the opposite direction, presenting the point with a .060" (1.5mm) lead. It has heavy gold fittings to hang from a necklace as a pendant. 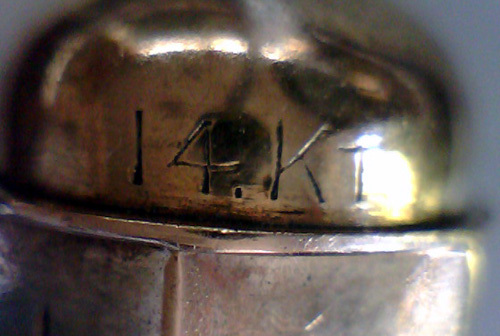 Marked "14K" on front dome. It has what may be the initials "HPR" in very heavy calligrapy, or, that may just be more of the scrollwork designs present on the other sides. This is definitely Victorian Bling. ITEM #4680: MORRISET DIPPER WITH MAROON / GREY MARBLED BARREL AND A MAROON TAPER. MEDIUM steel nib and clear feed. ITEM #2366: COLLAPSIBLE (PUSH/PULL) GOLD FILLED VICTORIAN PENCIL. Uses .036" diameter leads (such as Sheaffer Thin). Collapsed, this measures 2.75". Extended it is 6 5/8". Maximum diameter (at the repousse crown) = .345". the outer holder is smooth gold filled metal and the inner holder (top half of extended holder) is a lined Guilloché (engine turned) pattern. No dings or dents. ITEM #2763: GOLD FILLED VICTORIAN SLIDE-OPEN PENCIL WITH AMBER STONE ON TOP. The stone is flat with a chamfered edge. 2 1/2" length while closed, 3 1/4" extended. Uses .036" lead, same as Sheaffer "Thin". No dings or dents. ITEM #4567: MECHANICAL PENCIL WITH A UNIQUE LEAD PROPULSION SCHEME. The pocket clip is attatched to a sleeve that moves up and down the chased nickel plated barrel, moving the lead in and out the front of the pencil.Notice how, in the second photo, the clip and sleeve have moved down the barrel and the .046" lead has come out the front of the pencil. That's how it works. No brassing or dents. ITEM #HUNT #102 PENS: These are tubular nibs, very similar to those used in the Parker 51, 41, and super 21 pens, but they won't fit in Parker pens. These are flexible, ACCountant width pens, as measured on a Parker factory nib grader. The outer diameter of these pens is .134". (If you're looking for an inexpensive tubular nib that will fit into the above mentioned Parker pens, I have Octanium Parker tubular nibs available for $25 - send me an email). ITEM #4296: SENGBUSCH SELF CLOSING INKSTAND. This is the first one of these I have ever found that is complete and un-damaged. No chips or cracks anywhere, and the floating closure mechanism and the ink pump still work. Thge seal around the top is still soft and pliable red rubber. The color on the hard rubber lid is at about 95%. ITEM #4623: GORGEOUS ART POINT PENCIL; A PIECE OF ART. I can't figure out if I should describe this as Gothic, Ramanesque, or Deco, but it's a very intense design and every time I pick it up I can't take my eyes off of it; it sort of attracts eyeballs and then glues them to it. It has a combination of finish and patina that contributes to it's near perfect appearance. Repels .046" (1.1mm) leads. This piece absolves pens of this general shape and era of the status they have been tagged with among collectors. ITEM #4415: UNMARKED MOTHER OF PEARL HOLDER WITH "H. M. SMITH & Co. NEW YORK No. 2" PEN. Comes in fabric covered, velvet lined hinged box with two hinges and two working clasps. Nice repousse metal work on the holder. Slight flexibility. Tip of mother of pearl holder is intact and not broken-off. ITEM #3605: SILVER VICTORIAN COLLAPSIBLE PENCIL. HALLMARKED with a lion (or cat) with its tail over its back followed by what looks like a lower case r, followed by what might be a sideways anchor followed by the initials of the maker, JF (with 2 dots between the J and the F - possibly by James Fenton of Birmingham - see last photo for notes on hallmark research). 3 1/8" long retracted, 4 1/8" long extended. Uses .036" leads, equiv. to Sheaffer "THIN". Has an amber flat jewel on top, and according to my stone appraiser, this is either quartz or tourmaline. No dings or dents. ITEM #4120: VICTORIAN SLIDING PENCIL, GOLD FILLED. Has a .058" lead in it - haven't seen this size before. Intricate metal pattern has initials "A.L.D." in very fancy script. Cracked amber jewel. ITEM #3374: MABIE TODD & Co. No. 2 HOLDER W/ RETRACTING "MABIE TODD & Co. N Y 2" FLEXIBLE PEN. In "Mabie Todd & Co. New York" clasped box. Wood handle has thick coat of orange paint (original). ITEM #4137: A NONAME VICTORIAN RETRACTING DIPPER W/ HUGE #7 FINE "JOHN FOLEY'S BANK PEN NEW YORK" PEN, SOMEWHAT FLEXIBLE. The tail of the holder also retracts into the body, as does the pen, making for compact stowage. ITEM #3427: STOCKMAN'S MARKER WITH GOLD FILLED HAND TOOLED METALWORK TYPICAL OF AIKIN LAMBERT, WIRTH, & THEIR CONTEMPORARIES. These were used by stock traders before it became electronic. This is also referred to as a "Port Crayon". It has a twist mechanism that repels and expells a thick waxy soft marker .216" dia. It has a cartouche inscribed with "GOLD CH & L CO." This is a very nice example of turn of the century metal working. No dents that I can detect in this heavy repouse snail pattern. 5 5/8" long, .378" dia. No dings or dents. ITEM #4550: A SEALING WAX STAMP. Implants the letter "C" on top of your wax seal. Wooden handle. Comes with a strip of red sealing wax. ITEM #4297: SCHOOL DESK INKWELL WITH CORK. This one has a glass lip around the top to stop it from falling through the hole. This glass lip is 1.9" in diameter. Right below this top lip, the outer diameter steps down to 1.7". At the bottom, the outer diameter of the glass has tapered down to 1.6". This is intended for 1 1.75" diameter hole, as stated on the bottom, molded into the glass, it says "FOR A HOLE 1 3/4 IN." It is about 1/2 full of ink, after all my travels with it, so we know the cork is still good.There is a small chip in the top lip of the glass, just under the cork. ITEM #3331: TINY VICTORIAN GOLD FILLED RETRACTIBLE PENCIL WITH FLAT AMBER JEWEL ON TOP. 1 9/16" long when retracted and 2 1/16" long when extended. Six sided faceted body is .11" across cross section. Uses .7mm leads. It appears to have turquoise beads set into the slider ring. No dings or dents. ITEM #4382: SPECTACULAR REPOUSSE STERLING SILVER FIDDLEHEAD PATTERNED HOLDER WITH HUGE "SMITH & TODD NEW YORK 1859" PEN. Super flexible pen has recently been re-tipped by Greg Minuskin. 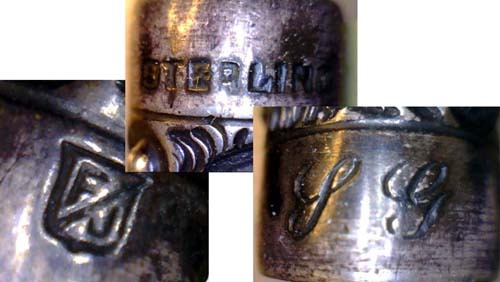 The sterling holder has a shield shaped hallmark with the letters "F/J" on the shield. The letters "L G" are inscribed on the lip of the holder in script. This is all visible int he photos below. This pen has intentionally been kept un-polished to preserve the patina. ITEM #3866: UNMARKED SQUARE EARLY MECHANIZED PENCIL, PROBABLY SILVER BASED ON THE APPEARANCE OF THE PATINA. Uses a .046" diameter lead. This has such a natural, even patina that I chose not to polish it. It's 3.5" long with a .26" square cross section. No dings or dents. ITEM #4139: VICTORIAN PEN CLEANER. This piece of artwork was used in the day when paper contained rag fibers which would amass on the tip of your pen and make a mess on your paper unless you somehow scraped them off. This device accomplished that using a set of bristles sticking out of this guy's head. An that's not all --- if you turn the metal cup containing the bristles over, it becomes a drby on his head. This could possibly also be used as an inkwell due to the large, open volume inside. Although his eyes are intended to look like diamonds, I believe they are probably just glass. I can't really tell, as I left my precious stone appraiser down in Southern California when I moved up to the Central Coast, so I can't have him take a look at it. This piece maintains it's beautiful, as-found patina and has not been polished. ITEM #3661: LEROY W. FAIRCHILD No. 7 SUPER FLEXIBLE RETRACTIBLE DIPPER PEN. Gold filled holder, also marked "FAIRCHILD 7". This medium pen (point) is huge, 1 9/16" long, .32" wide, with a weight of 1.1 gram (.7 dwt). The pen, holder, & taper are 6.75" long fully extended and 3 3/8" when collapsed. The metal surface is covered withg a delightful Guilloché (engine turned) pattern. No dings or dents. ITEM #4155: CIRCULAR FELT PEN CLEANER. This is a 2 1/2" leather and felt "sandwich" that was used to clean off the paper fuzz from the tip of your dipper. It has two leather disks on the outside with 5 circuoar pieces of felt in between. The felt is not sewn togwether, rather it is loose, allowing the pen tip to be inserted between the pieces of felt and wiped or rubbed clean. There is a small tear in the bottom piece of leather, but the piece that came out is included. ITEM #4018: TRAVELER'S WRITING KIT. An interesting progenitor of the iPAD, this is the smart, literate, Victorian's personal communication device from a few generations past. It includes a sealed inkwell, a rolling blotter, and a fixed-down brush for cleaning the fibrous fuzz from that expensive rag paper they used to use off of your pen tip. Complete in it's elegance with damascening worthy of a well made pocket watch, it measurs 2.67" dia. and 1.56" high. ITEM #3865: EAGLE ARROW PUSH BUTTON OPENING DIPPER PEN. Actuated with a push button on top which lowers a cone-shaped "trap door" that closes and protects the point when stowed and locks the point in place when opened. An ingenious Rube Goldberg type of mechanism on a retractible dipper pen. Fitted with a No. 2 STANDARD RAILROAD point of the Falcon style. No dings or dents. ITEM #3863: AIKIN LAMBERT RETRACTIBLE DIPPER. Both the pen and the holder are marked "AIKIN LAMBERT & Co. 5" on this medium sized (6 13/16" long x .344 dia.) dipper witrh a monster 1.5" long X .276" wide No. 5 Medium pen (nib). This holder comes with a polished hard rubber taper and gold filled handle & mechanism. The surface of the metal is done in an impressive Guilloché (engine turned) pattern. It also comes with a velvet purple box with nickel plated hasp and brass hinges. No dings or dents on pen or holder. ITEM #2695: COLLAPSIBLE GOLD FILLED VICTORIAN COMBO. 6.25" long when both pencil & pen are extended. .312" largest diameter. Uses .120" diameter leads. Fitted with a Hunt Imperial # 101 flexible pen. No manufacturer's name appears on this piece. No dents or dings in the gold filled holder which has an inticate Guilloché (engine turned) pattern on the surface of the holder as well as the ring which is used to extend the pen. ITEM #3635: JOHN HOLLAND No. 8 RETRACTIBLE PEN WITH GOLD FILLED HOLDER and AND BLACK HARD RUBBER DETATCHABLE TAPER. The holder is not marked, but the ultra flexible pen is marked "JOHN HOLLAND CIN. O. No. 8" This is a very large pen (point), being 1 5/8" long and weighing in at 1.0 gram. No dings or dents in the holder which is covered with an intricate Guilloché (engine turned) pattern on the surface. No dings or dents. ITEM #3959: GOLD FILLED REPOUSE SHORTENED SNAIL PATTERN MECHANICAL PENCIL. A nice little 4 5/16" long piece of turn of the (last) century workmanship. The mechanism works fine and the length of the barrel has no dents or dings that I can see.